Graduation day was a big deal for this Georgia mom and her daughter who got the chance to walk across the stage together. 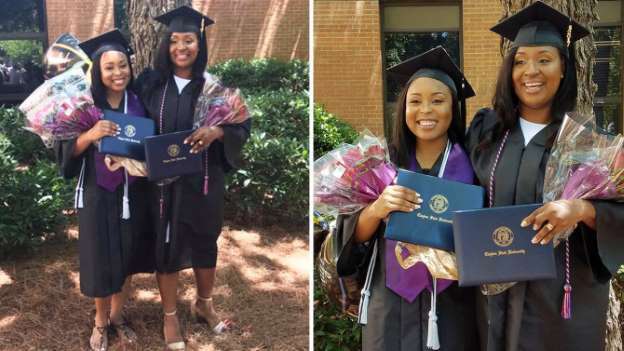 Cancer survivor Tasha Oliver, 44, and Cierra Patterson, 24, both received their bachelor’s degrees in health care management from Clayton State University in Morrow last week. They never planned to graduate from college together. Her mom had started taking classes years before her daughter, but they eventually reached about the same point in their degrees because her mom was delayed by cancer treatments. She explained her mom gave birth to her when she was 19 and went on to pursue a career as a cook in the military. After battling breast cancer in 2005, Oliver became unsatisfied with her job and decided to pursue her college degree in 2008. But around 2010, she battled breast cancer for a second time.